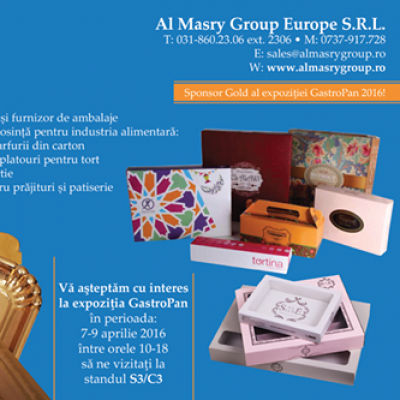 Al Masry Group Europe is a trading company specialized in " Fast Moving Consumer Goods" (FMCG). To Bridge the gab among the different countries by offering different high quality products. We are proud to represent number of the most important manufacturing entities by making their products available within the European market. Here you can find our catalogues, in Pdf, stay tuned for our updates. 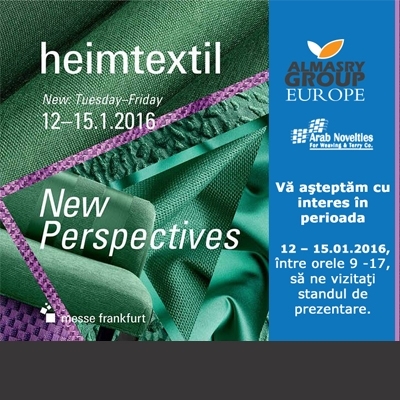 Arab Novelties in Egypt, a member of the El Sheikh Group company, through its only European distributor, Romanian company Al Masry Group Europe Ltd, invites you to the Heimtextil 2016 exhibition, the largest international fair trade in textiles for home, which It will take place in Frankfurt, from 12 -15 January 2016.In this exhibition you can visit us at stand G34 in hall 8, where we will present the latest news from Arab Novelties company and we have the opportunity to know our future business partners.We look forward to between 12 - 15.01.2016, between 9 -17, to visit our exhibition stand. Al Masry Group Europe is a trading company specialized in " Fast Moving Consumer Goods" (FMCG). To Bridge the gab among the different countries by offering different high quality products. We are proud to represent number of the most important manufacturing entities by making their products available within the European market. Str.campul Linistii, Parc industrial FNC, Corp E Arad romania Sales Office: Regus Floreasca,169A, Calea Floreasca, Building A, the 4th floor, office no. 2045, 1st District, Bucharest, 014472, Romania.